Thank you so much for your continuing support. We hope you will enjoy reading a little about the work of Spring of Hope. SOH currently work alongside Mount Zion and Kisega Primary Schools. 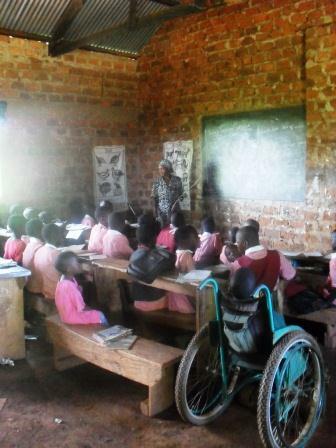 We have 20 children sponsored at these schools; our heart is to see that these children learn vocational skills. The start of school year has just begun; the children are thoroughly enjoying their new term, they have already had a team from Canada visit them, where they had a sports and craft morning. We are excited to see some new initiatives, so we far we have seen five more children sponsored (we still have a long waiting list please see our website for more information regarding children who need a sponsor). For Some time, we have wanted to develop the education for children with learning disabilities and learning difficulties. We are excited as this is now the season for this to happen through the help of Erin Powel. A volunteer special needs education teacher from the USA working with us until July. She will be working with these children and training staff in this area. We are excited to see where this will end up. In January after three years of dreaming and waiting until the right time, we started Parish clinics. Over the last few years we have come to realise why cannot home visit all the 600 children we work with. So why not bring the services of Spring of Hope to where the children are. In Kangulumira, there is 6 parishes each made up of 6 villagers. In January, we went to Seeta Parish and in February, we went Kawoomya parish and Nakuntundu. We were surprised by the attendance, which was 58 in Seeta and 72 in Kawoomya. Our plan is to focus on hosting two clinics which will involve four parishes until our funds increase then move onto all 6 parishes and 6 clinics. The kids had various types of disabilities: physical, cognitive disabilities, Epilepsy, hearing impairments, ADHD, and various other needs. One of the major challenges we are finding is stigma, many of these families who have never been reached before have a very negative attitude towards their children. This is confirming what we are doing is very much needed. Home visiting From Monday, Tuesday and Friday we go out and visit children in the local communities and we do occupational and physiotherapy therapy work. Each day we try to see three children, the idea of home visiting is helping a parent to know how to enable its child to reach its true potential the majority of our home visiting are children who are totally dependent on their parent and their parent needs to know they are not alone and through exercise their child can achieve much more than once believed. Activities of daily living is a program of empowering children who are less dependant upon their parents but are needing to learn independent living skills. The children we see through this are children who in time can learn to independent. Many parents need to see that their child can peel matooke(food) or wash their clothes before believing they can. Much of our time is spent encouraging a parent and teaching a parent how to get their child actively involved in daily life. In the past we have had parents amazed that their can be actively in daily activities of family life where the parent never believed they could atain such skills. Clinics – twice a month we hold clinics: Wabwoko Village 150 patients + 100 in our local office. This covers assessing needs of the children, advising the patients and giving out medication. 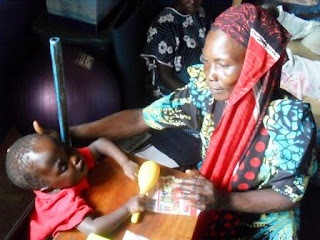 We also teach health skills and basic knowledge skills of life. Parents sometimes delay bringingtheir child to a clinic; unfortunately few parents bring their child every month. We work with them so they understand that it takes commitment to see changes in their child’s life. Many parents are still looking for a one off miracle of healing in the lives of their child Instead for example of learning how to manage the epilepsy. Slowly parents are learning the importance of managing their childs epilepsy. Drop in day Every Thursday we run a drop in clinic where parents come to the office for physiotherapy. They are taught how to carry out the exercise. By bringing the parents together, they learn more and are able to support one another. We believe it is not the work we do which makes a difference but the skills we teach and empower the parents to have. Bringing parents together, helps the parents to learn from one another and realise that they are not alone often a parent believes she is the only person who has a child with a disability later she meets other parents and her love and understanding of her child grows. On average we receive around 20 parents with children with disabilities. Our SOH Merchandise shop where you can buy a T-shirt or mug to support the work we do here in Uganda http://www.cafepress.co.uk/springofhope - even if you’re not living in the UK you can buy a Tshirt in your currency and get it posted with any extra charge. or on how to send a check or cash please contact us.